Rotterdam isn’t known for its nature or lavish gardens. Instead, the harbor, architecture and the river are our eye catchers. And yet, the city has a lot to offer in the nature department. A spot I visit multiple times a year is Trompenburg. It is a relatively unknown garden just outside the city center, next to football club Excelsior’s stadium. Trompenburg dates from the 19th century when is was planted as an outhouse garden for the rich. Today it is owned by the city and it is remarkably large. 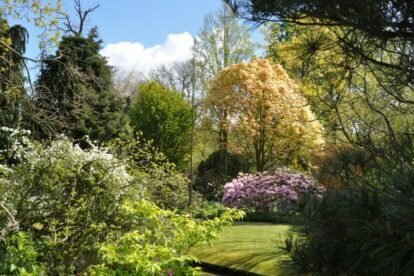 You could easily spend a couple of hours in the garden enjoying all the special trees, plants and animals. Many trees are decades old and especially in the spring the garden is a true color festival. Around every corner awaits a new beautiful surprise. In the back you can sit down and enjoy a well deserved coffee break or have a quick snack. The park is well maintained in a kind of ‘English garden style’ and surprises me with its beauty every time I visit. Despite being in the middle of the city, Trompenburg is an oasis of silence and nature. It is a (cheap) spot to come to my senses and to prepare myself once again for the busy city life. Or to just enjoy a relaxing afternoon. Either way, it is by far my favorite park in the city.